ok lets see what you have used this oil for and why? i'm useing it for my children . You will se him listed quite a few times. I see him for bakers, brewers, etc. ok but what i was wondering is what others have used this oil for and how did it turn out ?i have this oil i was just wondering how others have used it ect.. sorry for repeating long day. say like i used it for this spell and this is what happened. i wanted to hear about there victories with this oil. hi mama micki i just wanted to say thank you. 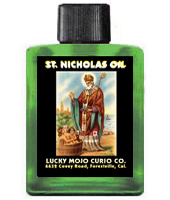 The saint nick oil works real fast too i love lucky mojo's line of products i can't wait till i stock up. they always work real fast for me i see results quick. the saint nick oil seems to have a calming effect on children. could i use this on a Santa claws candle? I'm looking for one that looks more like saint nick than Santa but if i cant find one would a Santa one work i thought it would be nice to put the oil on the candle and have the grand baby's Christmas list and letter to Santa under it?like it's there petition paper.along with milk and cookies? You know, I might do that too!